Thai style rice dishes for a perfect morning! 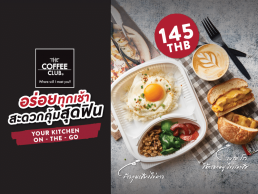 Drop by THE COFFEE CLUB to enjoy new Khao Tom set includes one bowl of piping hot boiled rice with a choice of 4 side dishes out of 15 items, only at 195 THB! Never miss your breakfast. Our new range of scrambled eggs bread rolls is a perfect morning treat that lets you carry your breakfast anywhere you want, and have it anytime you need! 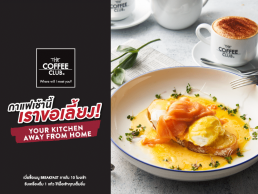 Each menu comes with one drink to finish your perfect breakfast when ordering before 10 am, only at 145 THB! get one coffee, tea or juice on us. 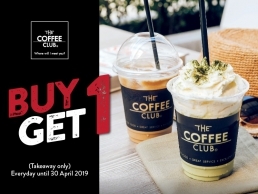 Celebrate our 10th year anniversary unlimited redemption of buy one get one free drink! 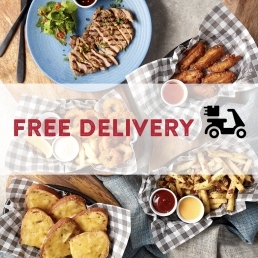 For a limited time we are offering Free Delivery so you can save time in your busy day. Good for any order made on our App or Website. No minimum order required. Good for orders within 3km of our participating Bangkok stores.